The TMNT are convinced that every time April covers the unveiling of some new invention, Shredder always happens to see the same televised report and shows up to try and steal it. This time, the Turtles think they can cut Shredder off at the pass by scurrying over to the Top Notch Scientic Corporation and standing guard over the SONIC DISINTIGRATOR – a device that can turn metal into powder. Big Louie and his henchmen break into the lab. Big Louie escapes leaving his henchmen behind to spill the beans. It seems that he had seen April’s newscast and decided that the Sonic Disintigrator was just the right tool for robbing banks. 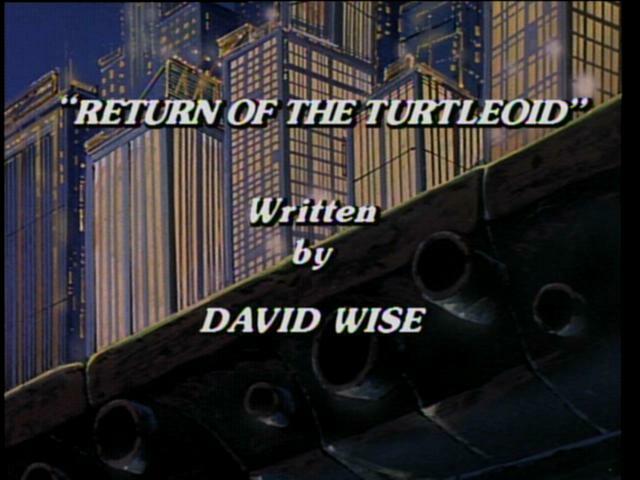 When the Turtles hear about the robbery they set out to investigate, convinced that Shredder and Krang are behind it. While searching they come upon Kerma, the Turtleoid from Shell-Ri-La. It seems that the Turtleoid has another “small problem,” Destructor X. After getting their butts kicked, Kerma and the Turtles are able to escape when they discover that bright light interferes with Destructor X’s sensor functions. Hiding out at Channel Six, Kerma explains that Destructor X is a law enforcement drone, programmed to hunt down criminals. Due to a clerical error, Destructor X is hunting for Kerma rather than the space villain known as Nerma. Big Louie learns that the Turtles are at Channel Six. But no sooner does he arrive, then so does Destructor X. During the course of the battle, Big Louie discovers Kerma’s portable gold making machine, decides that it is worth more than the Sonic Disintegrator and leaves with it. Meanwhile, the Turtles are running out of light to keep Desructor X away so they leave also. Halfway to who-knows-where, Kerma explains his new “small problem” and the Turtles decide to take Kerma to April’s apartment. 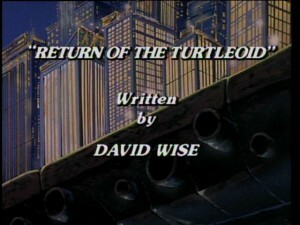 After enlisting Splinter to help watch after Kerma, Donatello and Michaelangelo head for the Top Notch Scientific Corporation to “borrow” the Sonic Disintigrator, believing that it is the only thing that will stop Destructor X, while Leonardo and Raphael hunt down Big Louie and retrieve Kerma’s portable gold making machine. As soon as the four Turtles arrive in April’s apartment Destructor X shows up as well. Splinter and April do everything that they can to protect Kerma. When things start to look hopeless, the Turtles arrive and use the Sonic Disintegrator, turning Destructor X into metal powder. The TMNT are then able to revive Kerma with the reflected light of his gold. Kerma once again thanks the Turtles for helping him out with his “small problem”, boards his rocket ship and heads back to Shell-Ri-La.